In the razor world, there’s only two real competitors for the most practical. Whilst there are other types of razors like a straight razor, these are generally considered to be better for barbers. The real contenders for us regular folk are safety razors and cartridge razors. They both work well, but in slightly different ways. And, it’s important that you get the best razor for your needs. The main difference between the two is the way that the blades are designed. With a safety razor, you’re getting one sharp blade to help shave closely. With a cartridge razor, you’re getting a specially designed 2, 4 or even 6 blade razor to cut through the hair. Of course, you’ll find people in both camps as to which of these razor methods that they prefer. It’s likely one of these types of razors will work better for you than the other, but it is difficult to know which one will perform better. Let’s break the two down and analyse the differences between the two. Undoubtedly the winner in this battle is the safety razor. The reason for this is that safety razors generally all use the same blade. You have a little slot where you can put the blade in once you feel that the old one has been used to it’s full potential. With safety razor blades, you can often buy them in huge bulk to help cut costs. You can often find 50 of them on Amazon for somewhere between $10-20, which works out at $0.20-0.40 per razor blade. Whereas with cartridge razors, you’re going to end up paying a lot more. Whilst this might not seem like a big deal at first, it can definitely add up in the long run. A good example is with the Dollar Shave Club, who charge more than $2 per cartridge. So for 50 of these, you’d end up paying over $100 – crazy! I do like the Dollar Shave Club cartridge blades though, and I’ve find a good way to get around the DSC expensive pricing. So overall, a safety razor will undoubtedly be much cheaper for you in the long run. Undoubtedly a cartridge razor is easier to use than a safety razor. This is primarily because of the way that they’re built. The safety razor uses a single razor blade. This means that you need to be super accurate with your shave and there’s really little room for making mistakes. With the single razor blade, you are in complete control of the angel that you’re going to shave your head at. It’s all down to you, and if you make any mistakes – which you will at first – then it’s decidedly easy to nick yourself. With a cartridge razor, the blades have been designed to be at a 30 degree angle to try and help prevent you from cutting yourself. This makes for a much easier cut than with a safety razor. Of course after time, you will get used to using a safety razor – but there’s a pretty steep learning curve. You will need to take more care when using a safety razor as opposed to a cartridge razor. With a cartridge razor, you can cut against the grain and not worry too much about irritation. But with a safety razor, you will have to be far more precise with your shave. This is one of the most divisive areas of the grooming community – which cuts closer out of a safety razor and a cartridge razor. I can only say my own personal preferences. And that’s definitely for a cartridge razor. I’ve found that I’m easily able to keep my hair cut completely down to the skull with a cartridge razor. I can definitely do this with a safety razor, but I do find it easier with my cartridge razor. It just gets a little closer to the skin for me. Overall, it really does come down to personal preference whether a safety razor or a cartridge razor would be better for your needs. They both have their benefits. 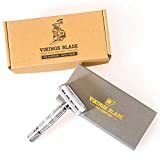 If you want to save on cost, then it can be advantageous to learn how to use a safety razor properly. If you want convenience, then you should undoubtedly opt for a cartridge razor.